March | 2015 | Careerschap | The musings of a careers professional in the higher education sector. I’m a great believer in experience shaping both our personalities and our careers. The opportunity to learn from doing is often seen as high value and advantageous especially from an employee / employer perspective (Although those familiar with Bloom’s taxonomy will appreciate and argue that “application” is a mid-level form of learning and understanding). We see this value in the push for obtaining work experience, especially in the HE sector in which I work where internships and year in industry placements are prize assets. Each of these stages supports the next stage but crucially Kolb maintained that for effective learning to take place all four stages need to be completed (although not always in order). It does however allow for people to jump in at different points. Perhaps key here is the duality of reflection and learning and how that process occurs. The example I will use here is the following statement. We learn by reflection but equally reflect on our learning. 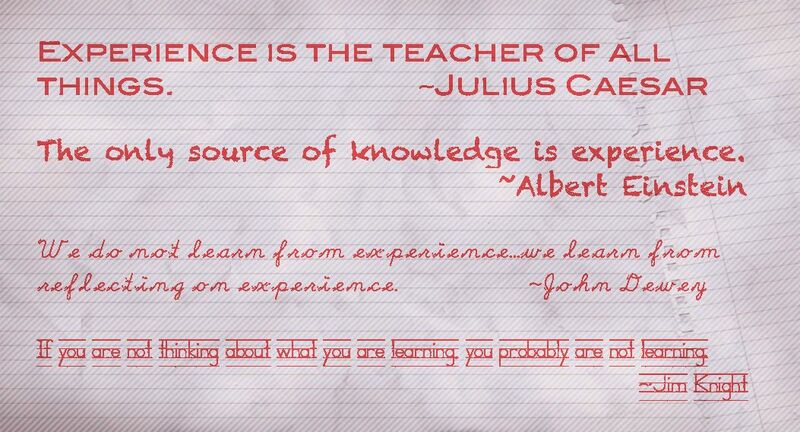 So here we are saying that new experiences can create the opportunity to process and gather new knowledge. One of the main reasons I like the model is the relationship to existing career choice theory and how we develop our career. In career development, planning and decision making we know individuals do not just gain control and understanding of their career simply by “doing things”. For example, just moving from job to job as an activity doesn’t necessarily give an individual the understanding of the big question such as “who am I?”. Here we are very much in the confines of socioeconomic or accident theory. Doing is not enough in isolation. Therefore, there is a strong correlation and relationship between Kolb’s experiential learning cycle and the newer career development and choice theories such as Savickas – Career Construction Theory, Krumboltz – Social Learning Theory and Super’s concept of vocational maturity. All these theories involve reflective practice informing thoughts, behaviours, actions and the very concept of self and who we are. Another strength is the process of how we train and mature as careers professionals could be argued to mirror the four stage experiential learning model. Concrete Experience: As unqualified careers practitioners before we enter training. This is where we have accessed the role either as a client or perhaps in a prior life have been put in a situation where we have delved into supporting someone in their career. Reflective Observation: We start some formal CEIAG training. For some it is via the NVQ route and for others the QCG route. Either way for most practitioners we are put in the situation early on in our training whereby we observe qualified and experienced professionals doing the job. We may then complete activities such as diaries/journals, group discussions and thought questions. In other words stepping back from the experience and reviewing it. Abstract Conceptualisation. Making the link to theory based practice. In training this would be the introduction of career and guidance theory and writing assignments. It would be making the comparisons between what is experienced and observed and how this relates to our current knowledge. Active Experimentation. Would also start in our training and arguably continue for the rest of our professional career. This is putting stages 2 and 3 into practice. For instance following interview models and having a conscious approach and rationale during guidance interviews. Early on in our career (and this is certainly my own experience) we spend a lot of time moving between stages as we observe, learn and experiment. You would expect a careers practitioner with experience to be spending more of their time in active experimentation or in other words doing what they are trained and able to do. Although as this is a cycle the expectation is that as new experiences are added we continuously phase shift through. Like all theories and models Kolb’s four stage model has attracted criticism. I’ve read comments calling it epistemologically problematic (yes I had to look that up!) which really highlights there is no universal agreement of how we all learn. For example, how we learn has been argued as much on a philosophical basis as it has a scientific basis. Different camps for this include constructivism, empiricism, idealism and rationalism. Quite simply Kolb’s model does not accommodate all of these perspectives (its primary focus is empiricism or learning from experience). Although I have argued a strength is its relative correlation to how careers professionals may develop, the actual process is quite simplistic and mechanical but nevertheless influential and well worth sharing and blogging about.